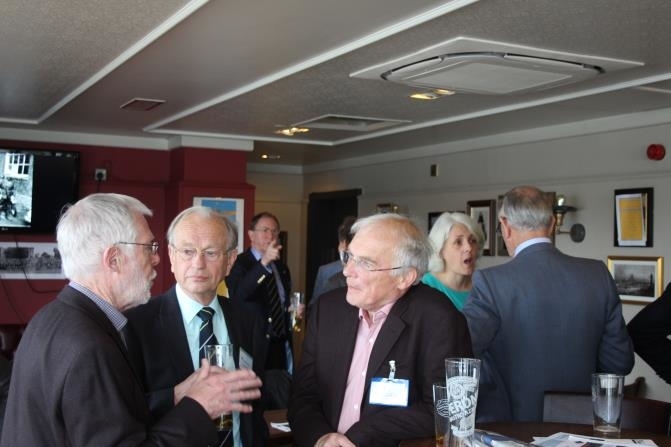 On a very soggy day in May, we saw 42 people arrive throughout the morning at our usual lunchtime venue, DOGGETT’s COAT & BADGE beside the Thames, with some having become quite drenched by the time they reached the pub! In the end there were a total of 37 OHs present plus 5 visitors, including Claire Morgan-Jones (HCS Development Director) and Helen Pearson (OH Club Alumni Officer) Joining us for the first time was Nicholas Brittain (not an OH) being the husband of Patricia (nee Hopewell) who is of course the daughter of former Headmaster Alan F. J. Hopewell (1945 - 1956). Jack (or Hoppy as we students nicknamed him!) was himself an Old Herefordian (1908 – 1911) and believed to have been the first ex-pupil to have returned as Head of his old school. Trish, as she was known to the boys in School House, lived with her father at No.1, Castle Street during the late 1940’s and early 1950’s era and, when not away at school in Malvern, often featured in official House photographs alongside her father, clutching her pet dogTigger. Amongst the Thirty Seven, we had another good cross-section of people in attendance this time, spanning at least four HCS decades. The most senior member present joined the Cathedral School in 1944, whereas the youngest left in 1980. Because of persistent rain, unfortunately we were unable to make use of the external balcony overlooking the river this time. The result was that it seemed rather crowded inside the Terrace Bar but it certainly did not DAMPEN our spirits! We welcomed back ex-Pat GRG Jones (Deanery 1948 – 1953) from Australia for this his third attendance at an OHiL gathering in the space of five years. He looked very dapper and spritely, and extremely fit for someone nearing the end of their 7th decade on this planet ( Could that be something to do with the Aussie climate? ) 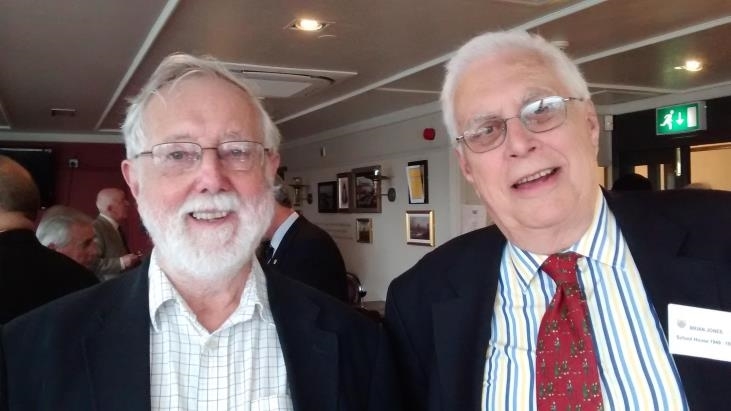 Ron, seen in both the above photographs wearing a light grey jacket but with back to camera, was pleased to link up with even more of his former HCS contemporaries. He had once more managed to organise his European itinerary so that it coincided with this latest buffet lunch. His first visit was in November 2010 with another OH ex-Pat Frank Crossman (1948 – 1952) accompanied by his wife Davina. 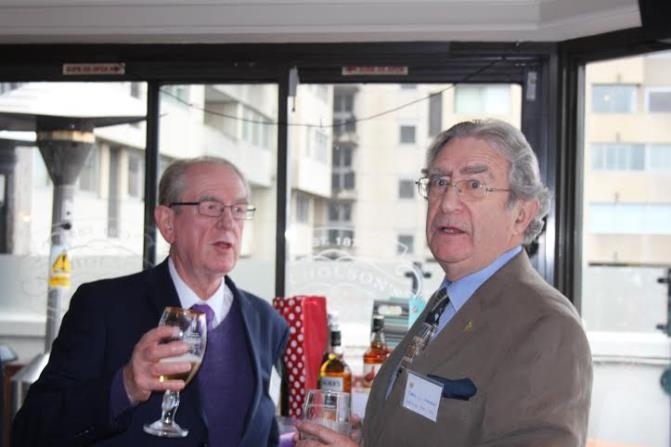 Ron then returned in 2012 during Diamond Jubilee Year to join us again on yet another one of his UK tours. Several members at this lunch left HCS for the last time in 1955. Therefore this event became a kind of mini 60th anniversary reunion for them. Undoubtedly there was much news to catch up on after such a long gap, hence detailed discussions ensued. Following a lot of laughter and banter around the room over a glass or three of something, the Revd. John Barrie (School Hse 1949 - 1956) was invited to give thanks before all guests sat down (or stood!) to enjoy a generous buffet. We again arranged for strawberries, raspberries and cream to be served as a dessert, although the produce unfortunately did not come from Herefordshire! 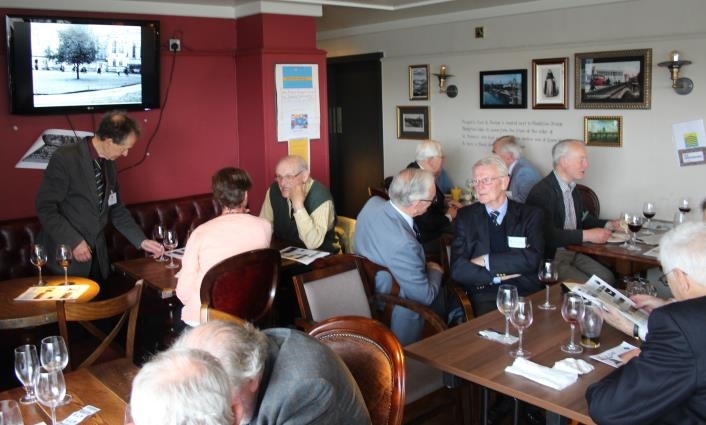 Members are thus ALL invited to return to Doggett's on Thursday 22nd October 2015 when we shall be staging our Tenth Annual Autumn Luncheon since an A La Carte menu was offered to some 30 OHs at our inaugural lunch on 8th November 2006.